Mid-America Christian University (MACU) announced that beginning in the fall 2015 semester, students will have the opportunity to learn from international recording vocalist Sandi Patty while pursuing a new, one-year certificate in worship arts and leadership. Sandi has agreed to partner with MACU in developing and delivering this opportunity for worship ministers. In addition to weekly course trainings, Ms. Patty will also meet with students prior to concerts for additional training and apprenticeship-type instruction. 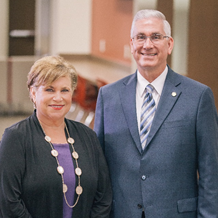 In March 2015, President Fozard met with Sandi Patty requesting her to pray about helping the university develop a certificate focused primarily on worship ministry. Fozard said as he began sharing his burden and vision for developing worship leaders that, almost immediately, Sandi shared she had been praying to do this very thing. Sandi and her husband, Don Peslis, have met with the Mid-America School of Music professors and administrative team to develop the program. “The fact is that I always wanted to be a teacher and my life took a little bit of a different turn performing all of these years. But as that season of my life winds down, I’m excited to wind it back up and be part of the faculty with this much needed certificate. It’s going to be an incredible impact on the churches in this world,” said Sandi Patty. • The certificate will be a one-year certificate covering twenty-four hours of college credit. • Students who qualify may receive federal financial aid. • Students may apply the hours to a bachelor’s degree in worship arts and leadership. The certificate program will be inclusive of all higher education age groups—recent high school graduates, existing college students and working adults. The coursework and training are ideal for those who feel led to pursue music ministry and those who are currently working in church worship ministries. Some of the courses may include weekly “tweet-up” sessions on Twitter. To follow the conversations use #MACUWorshipMinistry or “follow” Sandi Patty: @SandiPattyP and MACU: @MAChristianUniv. As one of the most highly acclaimed performers of our time with five Grammy awards, four Billboard Music Awards, three platinum records, five gold records, and eleven million units sold, Sandi Patty is simply known as The Voice. Sandi is the most awarded female vocalist in contemporary Christian music history, with forty Dove Awards. She was inducted into the Gospel Music Hall of Fame in 2004 and as an Indiana Living Legend in 2007. She has released more than thirty albums, including her latest Dove Award-winning album, “The Edge of the Divine” (2010) and “Everlasting” (2013), which was nominated for a Dove Award for Inspirational Album of the Year in 2014. In 2014 she released her brand new holiday recording, “Christmas Blessings,” with exclusive special editions in Cracker Barrel Old Country Stores and Target Stores nationwide. Sandi’s upcoming lullaby project “Sweet Dreams” will be released to retailers nationwide in partnership with Fisher Price. For more information about Sandi Patty, please visit http://www.sandipatty.com. MACU is a private, Christian liberal arts college that offers a variety of academic programs, online and on-campus, that include the associates, bachelor’s and master’s degrees. Degree programs include: behavioral science, psychology, counseling, business administration, international business, Bible & theology, leadership, health care, accounting, criminal justice and teacher education. Learn more at www.macu.edu. This entry was posted in All Church of God, Central, Colleges & Universities and tagged education, higher, leader, leadership, MACU, Mid-America Christian University, music, Oklahoma City, worship. Bookmark the permalink.